Imec’s goal is to create the solutions and building blocks for a better life in a sustainable environment through innovations in microelectronics. Semiconductors have indeed made the impossible possible. They have penetrated our daily life at an unprecedented speed. More and more, they are influencing every aspect of our life, of our world, making it a prosperous, sustainable world. Through the years the main focus of research in microelectronics was on scaling: making chips smaller, faster and more performant. The result of this work is reflected in the laptops and cell phones we use. Without the driving force of miniaturization the world we live in would be completely different. In the research on microelectronics this scaling is still important, we now entered the nanoelectronics era. However, CMOS scaling is not the only research focus. Energy, healthcare, wireless communication, visualization systems and sensor systems are the research domains imec covers. One way to make breakthrough leaps is to actively exploit connections and leverages between the expertise domains. Energy is an important topic in sustainable development. Imec’s energy research focuses on some of the key technologies for the future grid, a grid in which energy will be generated, stored, transported and consumed in an intelligent and sustainable way. The electricity grid is indeed step by step changing in a smart grid that cleverly manages renewable energy sources. Electrical equipment at home will operate in an intelligent and power-friendly way by communicating with the grid. Of all sources of renewable energy the sun has by far the largest potential. To use that potential and to increase the share of energy generated from the sun, the cost of energy generated by photovoltaic systems will have to come down. Bringing down the cost per kilowatt-hour is done by improving the efficiency of the solar cells. Another way is to improve the manufacturability, reducing the amount of silicon used in a silicon-based solar cell for example. Another is the manufacturing of organic solar cells. These are potentially very interesting for a number of reasons. 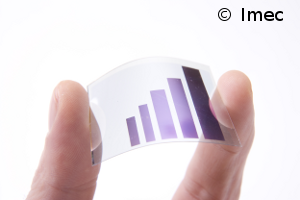 First there is the prospect that they can be fabricated much cheaper than silicon solar cells. Also they can be made to cover large areas by means of low cost printing and coating techniques that pattern the active materials on flexible substrates. That would make them suited for applications as lightweight building materials and smart textiles. Solar cells generate a DC current that must be converted to AC before it can be used in the grid or in home appliances. For this switching of energy power electronic components are needed. GaN is a well suited material to make these components. 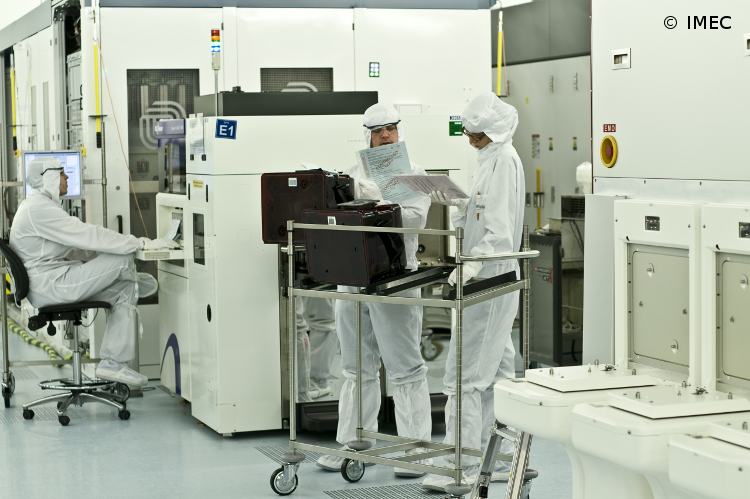 Imec is exploring the technology to deposit the GaN on silicon wafers. The next challenge is to make the GaN processing compatible with CMOS processing. Saving energy is also a challenge. One way to reduce the use of energy is to increase the lighting efficiency. This is done by improving GaN high-brightness LEDs. Efficient communication is one of the key issues in the globalizing world. The amount of data transferred both long range and short range is increasing very rapidly. Imec designs innovative solutions for tomorrow’s wireless communication, exploiting the newest technologies. Green radios open new horizons in wireless communications, these are fully-integrated energy-efficient solutions which increase the performance and possibilities and at the same time drastically reduce the power consumption and cost. Cognitive reconfigurable radios, flexible radio chips that can switch between communication standards, looking for the best tradeoff in each situation. These radios will be used in intelligent multi-standard terminals, such as the smart phones of the future. mm-wave radios that exploit the huge capacity available at 60 GHz for short range gigabit-per-second communication. Ultra low power radios that can run on a power supply 10 to 100 times lower than the conventional low power systems. These will be the key enabler for tomorrow’s wireless transducer systems, such as wireless sensors in intelligent buildings, machinery and body area networks. More and more of today’s consumer products include data intensive applications. With today’s 54 Mbps WLAN (wireless local area network) technology it takes you ten minutes to download a 120 minute classical DVD. With a multi gigabit per second link it would only take you a few seconds. Radio frequencies below 10 GHz are completely congested. The license free band at 60 GHz is a great opportunity. 60 GHz radio solutions exist at the moment but they are very expensive and power-hungry. More integrated solutions with drastically improved energy efficiency are needed if they are to be used in battery powered and mobile devices. Low power is important for ultra small wireless and autonomous sensor systems. To power these systems research is done on micro power generators that harvest energy from the environment, e.g. from the vibrations produced by machines. These generators can convert energy efficiently into electricity, which can be stored in micro batteries. Another possible source of energy is a temperature gradient, the temperature difference between components of a machine or between the human body and the environment. Wireless communication and low power in needed for the application in the healthcare and life sciences program. 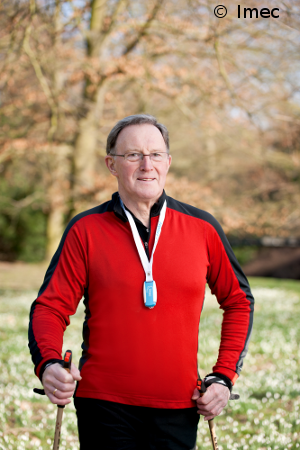 Readouts for sensors attached to or in the human body for long term monitoring and therapy is an example. With these research topics imec can help create solutions for a sustainable future. Performing the research also consumes resources and energy. The eco team at imec will investigate the ecological footprint of the clean room and set up actions to increase the eco awareness of all collaborators.